Bayer Leverkusen winger Julian Brandt made his 100th Bundesliga appearance in his side's 2-2 draw Hoffenheim on Saturday, becoming the tenth-youngest player ever to reach the landmark. Watch: Brandt becomes Bayer's youngest ever Bundesliga centurion! 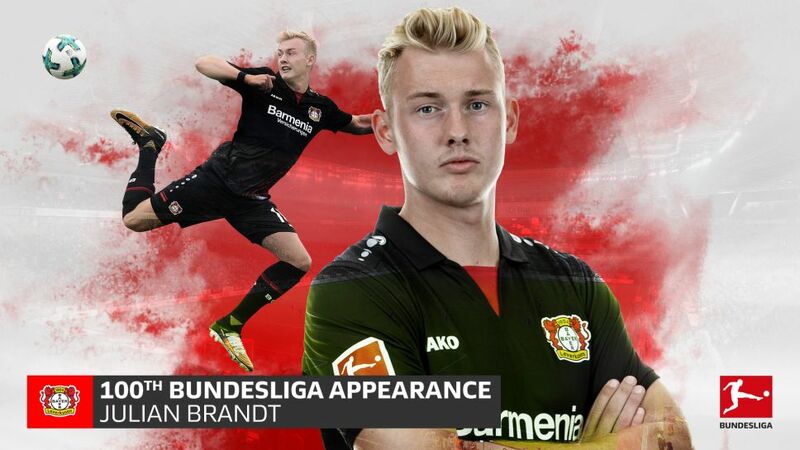 Starting in Leverkusen's first home game of the season, Brandt became the youngest player in Die Werkself's history to reach a century of Bundesliga appearances at the age of 21 years, three months and 25 days. For his part, Brandt was looking past the milestone ahead of the game and to what a win would mean for Die Werkself, who finished a disappointing 12th last season. "I may still be young, but I am into my fourth year now and I feel a share of the responsibility for our bad season," Brandt told German sports daily Kicker recently. "I therefore see myself obliged to get this club back to where they belong, and for me that means a place in the top six."